The man who had suddenly appeared at the top of the hill was a stranger. Right below him, and carrying a dead boar between them, were three men who had hunted in this area since childhood. Fear flicked across the stranger’s face. His nostrils flared as he sucked in more air; his eyes widened, and the landscape became larger before him. The three men dropped the boar and raised their weapons. They stood there, staring at each other. The stranger tried his best to smile. Two of the men glanced at their leader for a sign. Then the sun came out. The chain of colorful stones the stranger was wearing around his neck glistened and sparkled. The leader’s eyes focused on the stones and he now wore an inquisitive expression. He had never seen such beautiful stones before. Then something amazing happened. Instead of killing the stranger and taking his colorful stones, he decided to trade. He would offer the hungry stranger some of his boar in exchange for those fantastic stones. Somewhere in the not too distant past, trade between strangers began. The old way had been “fight or flight”. If you saw strangers, you either ran from them or tried to kill them. 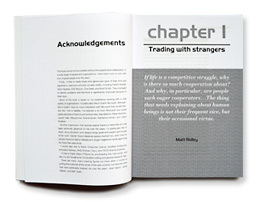 Once we learned to trade with strangers, our world jumped on a rollercoaster of change and progress. We ventured beyond our tight-knit families and tribes to build cities and civilizations. We moved from isolated villages to the global village, and to the World Wide Web. If there’s one reason more than any other that Web sites fail, it’s because the web teams managing them lack understanding of, and empathy for, their customers. The customer is a stranger and this book is about helping you understand your customers so that you can create more intuitive Web sites that are truly easy to use. The pull of the tribe-the organization or departmental unit-is great, but it is the single greatest source of Web site failure. This book will give you a range of techniques to avoid that pull and to truly understand and design for the stranger. And it is as much about intranets as it is about public Web sites. Remember, employees are the customers of the intranet. To live in the modern world is to be surrounded by strangers. To live in the primitive world is to live only with family, the department, the tribe of graphic designers, or content writers. This you must resist, which will be hard because the Web is a cold place. It’s not like running a shop or a restaurant or an offi ce. You don’t get the normal feedback you would get if you were a manager and walked into your supermarket and saw big queues at the checkouts or unhappy faces. Real people use your Web site every day. Real people? Yes, real people. Strange as it may seem, that’s an incredibly hard thing for most of us involved in Web site management to understand. And out of sight is out of mind. We don’t see these “people”, so in essence they don’t exist. That is why Web sites fail. The Web sites that succeed get constant feedback from their customers as they seek to complete tasks on the Web site. This book gives you methods to get that feedback in the form of defensible management metrics. Over a 15-year period, the ideas have been developed within some of the world’s largest organizations, including Microsoft, Tetra Pak, Rolls-Royce, Schlumberger, IKEA, Cisco, and OECD (Organization for Economic Co-Operation and Development). Every Web site has a small set of tasks that deliver a huge amount of value. These are the top tasks and they exist in what I call the Long Neck. Every Web site has a large range of tiny tasks. Carefully managed, these tasks have the potential to deliver value, but they also have real potential to destroy value by getting in the way of the top tasks. Manage the top tasks, not the content or the technology. Focus relentlessly on helping your customers complete the top tasks as quickly and easily as possible. There are two skills you must develop if you want to succeed in web management. The fi rst is empathy for your customer. You have to develop a real feeling for your customer (the stranger), to think like your customer and use the words your customer uses. Easy to say, but one of the most diffi cult challenges that any of us faces is walking in someone else’s shoes. The second skill involves linking and connecting. The Web is, in essence, a network and you must combine empathy for your customers with an understanding of the journey they are on-the tasks they need to complete. In order for them to complete their tasks you will have to create appropriate links. Linking seems simple, but is incredibly hard to do right, because to create great links you must be truly thinking like your customer, using their language, making it as simple as possible for them, and saving them as much time as possible. When researchers fi nally counted the number of genes in the human body, they were a bit depressed. They had expected to fi nd a lot more. You see, they already knew that an earthworm has about 20,000 unique genes. Surely, the grand and majestic human would have at least 10 times more? Not so. The poor old human only possesses about 30,000 unique genes. (Now the earthworms were delighted. It was frontpage news on Earthworm Daily, and they partied for a week.) Both humans and earthworms are networks. And a network is made up of two things. There is the node, the gene, the webpage. This is the place, the thing, the entity. But the gene on its own is not a network. It needs something else that is much more crucial in creating a network. So what is it that makes a network a network? It is the link, the connection. And this is the difference, a major difference, between us and those party-animal earthworms. Humans, you see, may not have all that many more genes than an earthworm, but we have far more links between our genes. It is the connections between our genes that makes us human, and it is the lack of connections between earthworm genes that makes earthworms, earthworms. So, even at the genetic level, there is a simple and compelling message: It pays to connect, it pays to link, it pays to cooperate. What about The Selfish Gene, you might justifiably ask? That wonderful book by Richard Dawkins brilliantly made the case that all genes care about is perpetuating themselves, and they use us humans and other species simply as gene-carriers and genereplicating machines. Colonies of genes they may be but, in their behavior, bodies have undeniably acquired an individuality of their own. An animal moves as a coordinated whole, as a unit. Subjectively, I feel like a unit, not a colony. This is to be expected. Selection has favored genes that cooperate with others. In the fierce competition for scarce resources, in the relentless struggle to eat other survival machines, and to avoid being eaten, there must have been a premium on central coordination rather than anarchy within the communal body. 60% (not 80% as Pareto suggests) of effects come from 20% of causes. How they search on the Web to find out more about Barack Obama or John McCain, etc. One of the key promises of the Web is the collapse of geography. We can go all over the world in an instant. And we can buy and sell digital items at almost zero distribution and storage cost. Physical things that used to be difficult to locate are now much easier to find. 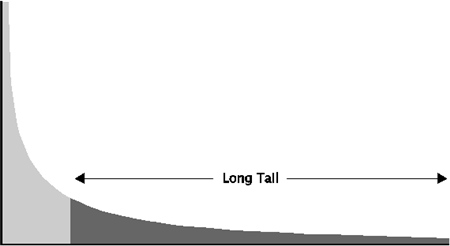 The theory of the Long Tail is that our culture and economy are increasingly shifting away from a focus on a relatively small number of “hits” (mainstream products and markets) at the head of the demand curve and toward a huge number of niches in the tail. As the costs of production and distribution fall, especially online, there is now less need to lump products and consumers into one-size-fits-all containers. In an era without the constraints of physical shelf space and other bottlenecks of distribution, narrowlytargeted goods and services can be as economically attractive as mainstream fare. 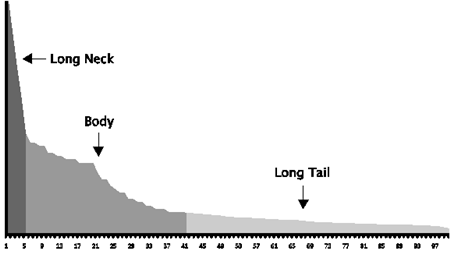 The Long Tail is a great concept and is definitely true in many situations. Being a fan of somewhat obscure music, I’m certainly delighted that I can use the Web to get music I would otherwise have been unable to find. We are now told that content will be created for free by a bunch of enthusiastic amateurs. In certain cases this is true, in other cases not. It’s hard to see a bunch of enthusiastic amateurs producing animation fi lms of the same quality as Pixar’s, or creating blockbusters like Avatar. While there has been an explosion in writing for children, it is not evident that there has been an explosion of J. K. Rowlings. It’s very easy to make and distribute music, but it’s not so easy to find the new Beatles, Rolling Stones, Bob Dylan, or Velvet Underground. Have you used an intranet that employs the enthusiastic amateur content development model? It doesn’t work very well, does it? There is a book inside everybody and the Web lets that book out. Quality content does not increase just because you increase the amount of content created. It just becomes harder to find. Your ability to manage the content on an ongoing basis. It’s easier to manage a quality search environment for a Web site with 1,000 pages than one with 10,000. It’s simply more likely that the right result will come fi rst. A good search engine is less than half the battle. Managing a quality search environment is more about psychology than technology. It’s about understanding the words people use and why they use them. Just because someone searches for “cheap hotel” does not necessarily mean they want a cheap hotel. Perhaps what they’re really after is a four-star hotel at a two-star price? Certain types of content don’t require ongoing review to ensure they are maintaining their quality. Much art, music, and literature can’t be wrong, so to speak. However, a description of how to treat a particular disease can become wrong as a result of new research. Product details may need updating, telephone numbers may change, policies and procedures may become outdated. In other words, some content goes out of date, and that is a significant cost of Web site management. Most web teams have a culture of launch-and-leave, when what they really need is a culture of review-and-remove and a continuous improvement of top tasks. That’s a cost-and the bigger the Web site, the bigger the cost. Much of the Long Tail is a Dead Zone. It’s a dead and useless tail full of dead and useless content. Perhaps it would be manageable if this dead and useless content stayed in the tail. Unfortunately, it doesn’t. It confuses the link options and gets found in search results, disguised as useful content by including words that people search for when they’re looking to complete top tasks. Because people are so impatient, they often don’t notice and end up using this useless content. They follow instructions that were intended for a previous version of the product. They take down the wrong number, they think the training event is on July 10, when that July 10 was for the previous year, and so on. This sort of content is not just low value, it’s destructive to value. Later, you’ll find out how to measure the impact of this destruction of value which undermines credibility, brand, and trust. We call it a “disaster” when customers come to your Web site and think they’ve gotten the right information when in fact it’s wrong. This book is about the other end of the graph, how to keep the Dead Zone content at bay. Sometimes this top end is referred to as the “head”. Through analysis of hundreds of such graphs it occurred to me that the “head” really looks more like a neck. Long Tail and Dead Zone: 60% of the content accounts for about 20% of the demand. In an age when there has never been as much stuff thrown at us, it’s never been more important to understand the essence of the situation. The more stuff there is out there, the longer the neck becomes. How does that happen? Well, when analyzing 1,000 search terms, for example, the top 50 search terms (5%) accounted for 31% of search volume. In other words, a small set of search terms were getting searched for again and again. However, when analyzing 5,000 search terms from the same search environment, the top 250 search terms (5%) accounted for 39% of search volume, an 8% increase. The Long Neck had gotten longer. The more choice there is out there, the longer the neck becomes. I call this the Bob Dylan effect. You can increase the number of singer-songwriters as much as you like, but there is still only one Bob Dylan. We are living through an Information Big Bang. How on earth is the most important stuff going to get found? When your customers have so much choice, why should they read or view your stuff? Furthermore, why should they act based on what they have read? If you want to make an impact-and avoid ending up in the Dead Zone-you need to understand the Long Neck. If you want to influence the impatient stranger-that’s to say, if you want people to buy, to follow a new policy, to decide in your favor, to think that what you say has value-you need to understand their Long Neck: the things that really matter to them. Understanding what really matters to a stranger is the single biggest challenge in web management. I once worked with a car manufacturer whose product managers and engineers thought that words like “engine” and “brand” were really important to their customers. But the words that actually mattered to their customers were “affordability”, “reliability”, and “low fuel consumption”. So, an organization may be focused on the same basic things as its customers, but if it uses the wrong words to describe them, then it’s speaking a different language. You’ll fi nd an “engine” in the Long Neck of an “engineer”, but it’s “reliability” that the customer really cares about. Your Long Neck and a stranger’s Long Neck are rarely the same. You must accept that and work with it. If you can manage your Web site from the stranger’s point of view, then everyone can succeed. 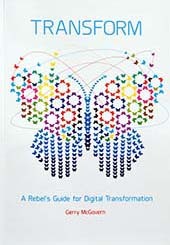 In our increasingly interconnected world-the essence of which is the Web-this is not a utopian dream but a utilitarian necessity. Know the stranger’s Long Neck. It is far more important to understand the Long Neck than the Long Tail. You might think that the Long Neck is obvious. Not so, and often what you think the Long Neck is, may not be what your customers think it is. Manage with facts, not opinion. A key shift in the modern world is a shift away from opinion and gut instinct, to hard data. Evidence is customer centric. Opinion is organization centric. 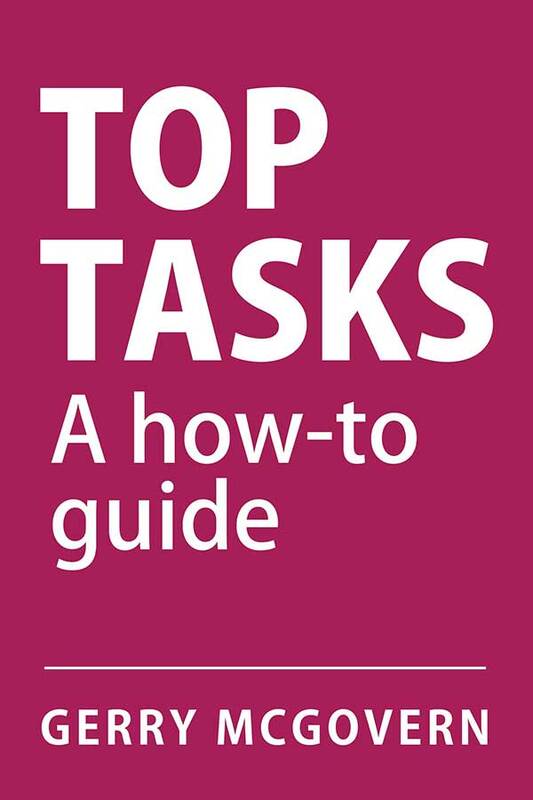 The Top Tasks methodology delivers an unparalleled glimpse into the minds of customers, even for organizations that are skeptical of user research. Are you a rebel? Are you a digital change agent? Do you want to transform your organization? Then this book is here to help you. The Stranger’s Long Neck will help you to maximize your organization’s performance online. Killer Web Content gives you the strategies and techniques you need to get the most from your Web content. The essential guide for online writers, editors and managers. Gaining competitive advantage through high-quality web content.